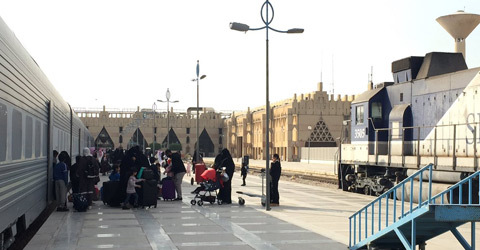 There are three rail routes in Saudi Arabia, run by two different state-owned organisations, Saudi Railways Organisation (SRO, www.saudirailways.org) and Saudi Arabia Railways (SA, www.sar.com.sa). Saudi Arabia Railways (SAR) - Riyadh-Hail-Jauf www.sar.com.sa. UK & most other nationals need a visa to visit Saudi Arabia. This route is run by Saudi Railways Organisation (SRO) although their website www.saudirailways.org seems inaccessible. Riyadh to Dammam is 449 km, the line opened in 1981. Dammam is close to Bahrain. Buy tickets at the station. There is no online booking as their website www.saudirailways.org is inaccessible. 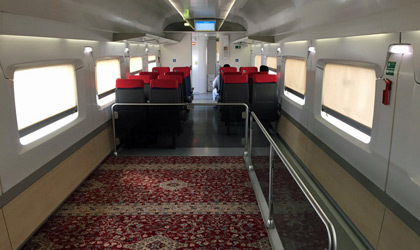 The Riyadh-Dammam trains are 5-car air-conditioned sets with a power car at one end and driving cab at the other. Built by Spanish manufacturer CAF, these trains date from 2011-12. 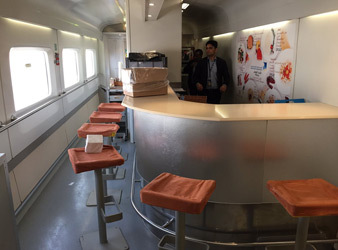 The trains have Premium (1st) class and Standard (2nd) class, a cafe counter and even a prayer area. 1st class seats. Courtesy of DiscoverByRail.com. Prayer area. Courtesy of DiscoverByRail.com. 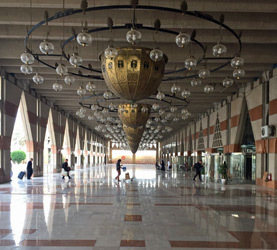 Riyadh station. Photos courtesy DiscoverByRail.com. This route is operated by Saudi Arabia Railways (SAR, www.sar.com.sa. They have a good website with clear schedules, prices and online booking. 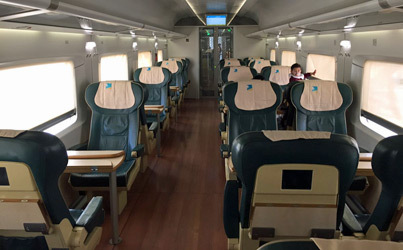 There are two daytime trains in each direction every day, plus an overnight sleeper with 4-berth private compartments which are sold by the compartment for single, double, triple or quadruple occupancy. 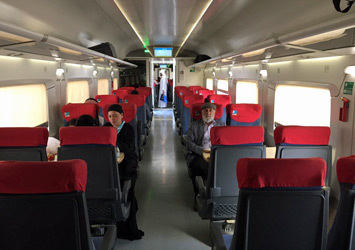 The new high-speed railway linking Medina, Jeddah & Mecca opened in October 2018. It's operated by 300km/h trains built by Spanish firm Talgo and run by Saudi Railways Organisation (SRO) although their website www.saudirailways.org seems inaccessible. Jeddha to Mecca is 78 km. Mecca to Medina is 450 km. So far, trains on this route have proved both busy (80%+ load factors) and punctual (93% on time). There are four trains each way on Saturdays & Sundays, two each way on Thursdays & Fridays, no trains on Mon-Wed. However, service is ramping up progressively to 7 days a week. Note that non-Muslims aren't allowed in Mecca.